Craigslist, the Website as it is now. A hypothetical redesign of Craigslist as envisioned by New York Times' designers. Wired magazine ran an article not too long ago in its printed and online editions entitled: “Why Craigslist Is Such a Mess.” The story outlined all of the problems with the visual design—and what Web designers like to call “usability”—of the hugely popular classified ads site. Wired notes that in spite of a design that violates “every principle of usability and common sense” the site remains immensely popular. Why is that? Part of the answer lies in the fact that Craigslist has no true competitors. It gained a here-to-fore insurmountable first-mover advantage in the late 1990s in offering free classified ads and has never looked back since. Companies that don’t have competitors don’t have to worry about design. They don’t have to bother to improve their product because there are no real alternatives. They sell features, not benefits. It’s a classic monopoly situation. Now take another example, prior to the iPod there were many makes of MP3 players on the market but they were not very user-friendly. Most players were geared towards people who really liked gadgets instead of the broader swath of the population that liked music but could care less about gadgets. Apple saw an opportunity to design a product that was both easier-to-use and more beautiful. By doing so, it was able to capture an astounding 75 percent of the portable music player market and, at one point, even as much as 92 percent. The comparison is not entirely apt as the iPod is a classic example of an industrial-era product while Craigslist represents a new media virtual public good of sorts. Certainly the economics of these two industries are very different and that might explain why Craigslist is a Website that has no true competitors and, thus, is not forced to make its product more beautiful and more usable. The undeniable fact is that even though it’s downright ugly, it’s usable enough. So does this mean that you should fire your web designer and make your site look like its 1999? Of course not. The first reason is that if you are a small business or self-employed professional, unlike Craigslist, you cannot afford to give away your product or service for free. You, we (Stylomate is also a small business) have to compete on the basis of something other than free. Small businesses have to offer tangible and intangible benefits. As consumers, we value Craiglist only because it’s free. If the company tried to charge us, we wouldn’t remain loyal and we’d go somewhere else that offered us free classified advertising. Again, Craiglist gives us a feature (free classified advertising) not a benefit. Since free things compete on the basis of this most basic feature of “freeness,” they don’t have to sell benefits. Free things can afford to be ugly or hard-to-use because so long as they do give us something we need, we want them only for their freeness. The second reason is that if you are a small business or self-employed professional in virtually any sector of the economy then you have an inordinate amount of competition. Your website, business card and other marketing collateral vie for attention in a very crowded marketplace. All this competition among firms selling very similar products or services means that you have to sell the benefits of our products and services and not simply the features. There are a lot of lawyers in Washington, DC and bankers in NYC. What makes you so special? This is where design can play an important role in communicating the main benefits that your firm offers. Design adds value by adding the perception of value and by associating products and services with benefits. The more professional your company’s image is, even if you are a one-person shop, the more likely you are to leave a positive impression on a prospective client. And not just any client, but “A-list” clients, the ones that are likely to spend more on your products and services. Are you an experienced firm that seeks to communicate this benefit? A minimal, clean business card and website design using blues, greens and black and that looks like it was created by a professional designer sends the message that you are a experienced and reputable professional (and certainly not free). The higher the quality of the design of your business’ identity, the better the impression you will make and the more likely clients will be willing to pay a higher price for your services. Ultimately, a strong business identity design and an equally well-designed and easy-to-use Website design says that you place a great value upon your own service and makes it more likely that clients will value you. After all, if you don’t give yourself a little love first, who will? Which Craigslist design do you like more? The actual one. The New York Times' version is too snooty and elitist. The New York Times' rendition. Only a mother could love the actual design. As designers, we are generally not known for our business acumen. Generally, we’d rather be designing someone else’s project than figuring out how to make more money for ourselves. Here is a fascinating interview via Mixergy.com with a bootstrapping design entrepreneur who built WooThemes into a $2+ million annual business. WooThemes, is a blog template, or “theme,” developer and is known for clean designs and code as well as extraordinary customer support. WooThemes’ cofounder, Adriaan “Adii” Pienaar, recalls how his father, in addition to business studies in college, caused him to search for ways of making “passive income” and turning design into a product as opposed to a service. The Internet has been a boon for designers in many respects as—at long last—it has created a way for design professionals to earn passive income streams by building and reselling templates, for example. In this video, one of the pioneers tells his story. You gotta love this guy’s humility. This has got to be my favorite business card designs of all time. It’s the work of the talented Spanish designer Sergio del Puerto, who runs the Madrid-based design and art direction studio called Serial Cut. It’s humorous without being silly. Humor goes a long way to ingratiating oneself, building relationships and peaking interest. It’s simple and to the point. 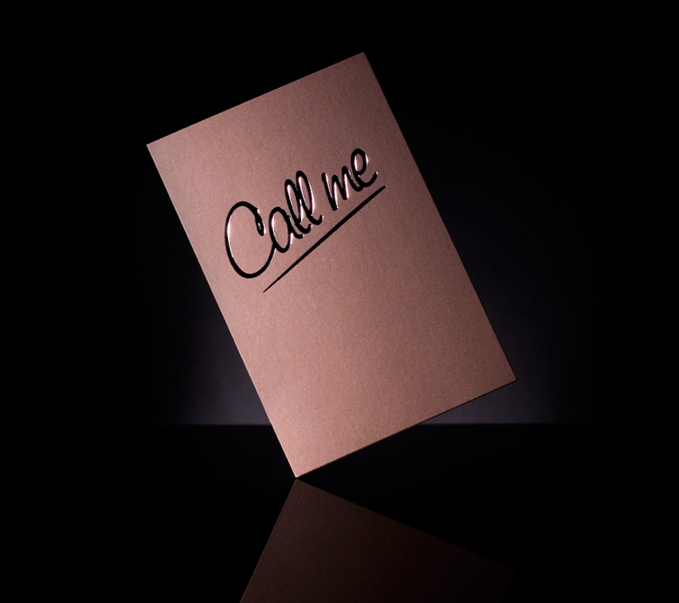 “Call me” on a busines card: it doesn’t get any more direct than that. It’s memorable. I bet you won’t forget this business card. Do you like this business card's design? I freaking love it. The best business card ever designed, without a doubt. I am in love with it but give me a break: there is no "best ever." I like it but don't love it. A beautiful die-cut business card with a minimalist design. I noticed this recent blog entry on a website geared toward graphic designers that—in addition to an impressive gallery of images of business card designs that use traditional but more advanced printing techniques—brushes upon some important points. The first is that it is pretty hard to stand out from the crowd these days as a result of glut of social and digital media. Social media has some important benefits (otherwise we wouldn’t blog or post to Twitter) but also some limitations. One of those, at least from a corporate identity design and marketing standpoint, is standing out from the crowd. At the moment, everyone (and rightfully so) is investing in their digital architecture, platforms and marketing. Very few are doing so with respect to offline marketing and that makes anyone who does invest in old school methods not only retro but unique. Any good business person knows to not follow the crowd. Ergo, where there exists an opportunity for differentiation, seize it. One simple bit powerful way to do this is for small businesses and self-employed professionals is by having a business card with a unique form. Die-cutting in the printing process is a way of giving a business card, for example, a nonstandard shape or to cut holes out of the card itself. Many people who have never thought about graphic design tend to think that “more is more:” more color, more graphics, etc. Another common and related misperception is that bigger is better: bigger type, bigger pictures, bigger logos, and the list goes one. Sometimes more and big might be good but usually “understatement,” simplicity and elegance transmit a stronger message of quality, dependability and experience, in particular in professional services like accounting, law and healthcare. One of the most appealing aspects of die-cutting and other specialized printing processes such as embossing (when done right) is that they are incredibly elegant, subtle and send an indirect but powerful message about the quality of the company or the business professional donning the card. So when you go to replenish your business cards ask your designer or design company about creative ideas with respect to the form and the paper and not just the visual design. Check out this gallery of inspiring business card design. 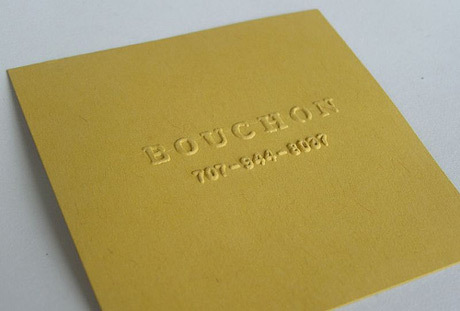 This embossed business card is extraordinarily elegant. No one but no one talks about business cards or business card design these and certainly no one talks about business card etiquette on the web. So when we found this blog article entitled Business Card Elegance And Etiquette by Search Marketer Max Kalehoff we took note. In a digital world comprised of social media, smart phones and augmented reality, business cards seem to be a relic of a bygone era. Not so, says Kalehoff, who argues that business cards, their design and the way we use them are just as important as ever. In spite of the speed, convenience and other benefits of digital communications and platforms, we still prefer their physical counterparts. After all, would you rather have a friend that you chat with on Facebook or would you rather have a friend that you can chat with over a beer. Face-to-face relationships and social rituals are still paramount to life and business. Don’t believe me? Well ponder this fact: in spite of the ubiquity of Amazon and eBay, only 3 percent of retail transactions in the U.S. are conducted over the Internet. The fact is, we’d rather go to a brick and mortar store, fawn over books or clothes or toasters and make small talk with the cashier. Business cards are important for this reason. We still prefer real, physical things and relationships to virtual ones. I don’t know about you but I am a bit suspicious of friendship requests on Facebook or LinkedIn from people I don’t know. I prefer a physical introduction and business cards can help with that. 1. The tactile experience is still important and so the material and surface of your business card matters a great deal. So buy quality paper that feels nice. 2. Have a beautiful and simple business card design. Hire a designer. Don’t be cheap. You wouldn’t scrimp on your business suit so don’t do it on your business card. They both reflect on you and your business. 3. Be minimal. We love this one. Use fewer words, not more on your business card. Have lots of white space. This is the best kept secret of designers and advertisers. Limiting ourselves is one of the hardest things to do since we have so much to offer. And yet, simplifying our message to the single most important thing that we want to say is critical to actually attracting attention and being heard. Communication is more effective the more simple and direct it is. The same goes for your business card design. 4. Carry a business card and make sure it’s tidy. Sage advice. Someone that has a polished business card readily available still makes a strong first impression in a digital word. There are some more kernels of wisdom in the article and we recommend you check out this old school marketing advice from a digital marketing pro. Manual of Style is Stylomate’s new blog that covers design and marketing trends for small businesses. Stylomate is communications design company whose aim is to help small business owners, especially those without dedicated marketing staff, and self-employed professionals create or access world-class design, technology and content to support their marketing efforts at prices they can afford. We have developed a simple survey in order to help us better understand your needs. It takes only five minutes. We welcome your input. And thanks in advance for taking the time to complete our survey.